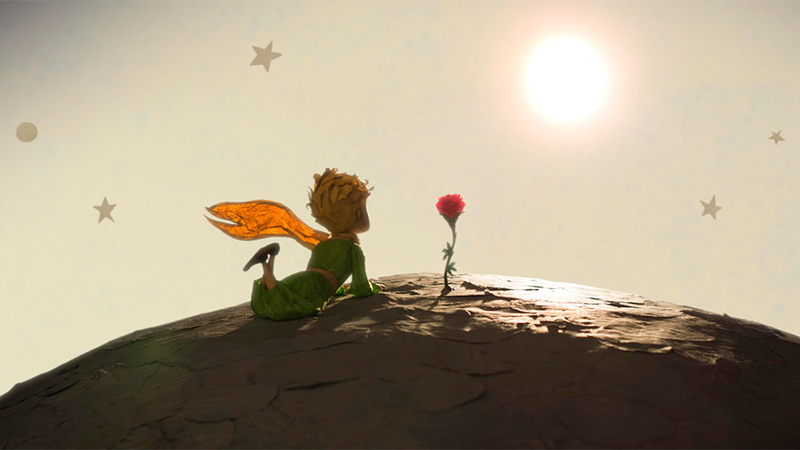 A still from the 2015 film "The Little Prince" directed by Mark Osborne, based off Antoine de Saint-Exupéry's book by the same name. “The Little Prince” by Antoine de Saint-Exupery is a story written in 1943 about a little prince who lives on a tiny planet. One day a rose pops out of the soil, dazzles him with her beauty, and perfumes his whole world with her scent. But he grows mistrustful of her coy ways of getting him to take care of her, so he harnesses a flock of birds to get away. He visits six other small planets each inhabited by a different single individual. Each one has a different sole purpose in life, such as to seek power (the King), admiration (the vein man), riches (the star counter), or knowledge for knowledge’s sake (the geographer). There is also a man whose world is driven by alcohol (the drunk) and another by a compulsion to obey meaningless orders (the lamplighter, who reminds me of myself and my OCDs). Finally the little prince falls to Earth where he befriends a stranded pilot trying to fix his airplane. He also meets a fox who teaches him how to tame it, as it wants to be tamed, meaning to be befriended or taken care of. He learns from the fox that although there might be thousands of foxes or roses in the universe, the ones you tame will be unique and special to you. The prince then resolves to get back to his rose. The only way he knows how is to allow himself to be bitten by a poisonous snake. His friend the pilot believes the little prince does indeed make it back to his planet and rose as the boy’s body mysteriously disappears. At first I felt this little story was just a sentimental fairytale. But when I thought about it more, I realized the story is profoundly true. Most of us do let the desire for power, admiration, or riches rule our individual worlds, if not addictions or compulsions. But the thing that we actually need and the only purpose in life that can truly make us happy is love. Love is a paradoxical thing — you have to give it away to get it, and the more you give away, the more you have. The little prince understands that sometimes love requires a lot of giving, even giving up one’s life. The prince’s life on his tiny planet symbolizes all “ordinary” lives; he has a small world, but he does have to take care of it. If he doesn’t everyday rake out his three miniature volcanoes or dig out the invasive baobab weeds whose roots could otherwise grow right through the planet and split it apart, his world would indeed explode and disintegrate. So the daily small things we do to grow the good or root out the bad in our individual worlds are essential. His love for the rose symbolizes love in the purest form, for the rose cannot give anything back for his taking care of her except for the beauty of what she is and her friendship. Los Angeles bishop Robert Barron delivered pretty much the same message at a recent lecture he gave at Google headquarters. He used a different story as his analogy, that of Elijah’s challenge to the 450 priests of Baal, the false idol that people did child sacrifice to, at Mt. Carmel 3,000 years ago (1 Kings 18). Elijah builds an altar to God, sacrifices a bull upon it, and douses it with water. The priests of Baal do the same without the water. Although the priests of Baal dance furiously around the altar of their false idol, Baal does not answer them. Elijah taunts them, saying that perhaps Baal is sleeping or away on a journey, but still nothing happens even as the priests cut themselves with knives to try to get a response. Finally, Elijah prays to God to show all the people who the true God is, and a pillar of fire immediately comes down from heaven to consume Elijah’s sacrifice. Bishop Barron points out how the world has always looked like that scene; most of us hop around to false idols of money, power, honor, and pleasure, even hurting ourselves in the process, seeking more and more of something that cannot ever satisfy. But then there are the Elijahs who stand among us, often in sparse company, who understand that only love satisfies because our hearts are made for God, who is Love Himself (1 John 4:8). I learned in my psychology class last year about Abraham Maslow’s pyramid of human needs. Psychologically, we first seek to meet our basic survival needs for things like food, warmth, and safety, then we seek out acceptance and love; if these needs are met, we go on to seek to use all our creative energies and talents in the service of some transcendental purpose. Even without the help of psychological theory, one only needs to read history past and present and observe the constant rhythm of the rich, famous, and powerful crashing to know that those things alone can’t bring happiness. For my New Year’s resolution, I can try to remember to pray each day to the God who reads all hearts for the ability to see and understand the hidden needs of those I encounter and the grace to love them as they need to be loved at that moment.